Raise Your Hand if You’ve Been to a Farmers Market! We are smack in the middle of farmers market season where you can find locally grown produce and other healthy, tasty, useful and interesting products from a fresh outdoor market. I’ve been enjoying Golden Colorado’s farmers market since its first year and have watched it grow and flourish into a market that includes not only fresh produce but fresh eggs, goats milk products, wild caught fish, grass fed beef, bison, fresh made pastries, oils, home products, food trucks and other prepared food along with too many other goodies to mention. My personal secret to enjoying the farmers market is to go early to get the best pick of produce, enjoy a little chit-chat with the farmers and vendors, avoid the crowds, and to beat the heat. However, there is something to be said about bringing your kids and dog, meeting friends and making a day of it. The sense of community farmers markets bring is priceless! Did I Mention Fresh? Farm Fresh! I happily leave my weekly trip to the farmers market with an abundance of fresh, and in most cases organic, produce that we truly enjoy during the week. In fact, most farmers picked the produce just the day before and got up at the crack of dawn to pack the trucks and drive, in some cases many hours, to the market making their products fresher than you could ever dream of getting at a conventional grocery store. All that work means your getting produce that has had less handling and will last longer when you bring it home. Couple that with reasonable prices and you’ll quickly find yourself becoming a regular at the farmers market. So please remember when you go to the market to give the farmers an extra big THANK YOU knowing that their passion keeps them working hard and getting up before the roosters to make their best products available to you. The closest farmers market in your area is most likely open once a week during the warm months but you can actually find an open farmers market every day of the week and, in many cities, open throughout the year. Some markets take it inside for the winter and though they can’t offer fresh local produce, they have other products available for purchase. 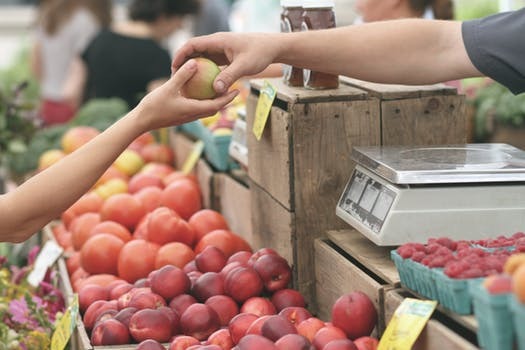 You can find farmers markets in your area with a simple online search of the USDA National Farmers Market Directory or an easy web search by including your state and city’s name. How’s this for convenience? I used to pad my pockets with a wad of cash but with the advent of small and cheap credit card readers like Square, most vendors take credit cards making it really convenient to get most of your grocery shopping done at the farmers market. The definition of buying ‘local’ is unclear and up for debate. Local can imply regional proximity or direct from farm to consumer. Some use the concept of ‘food miles’ from The Food, Conservation, and Energy Act of 2008 which defines local and regional food product as “transported less than 400 miles from the origin of the product or the State in which the product was produced”. The net take away is that most products at your local farmers market are local because the sheer distance to drive over 400 miles to get the product to the market isn’t cost affective for the farmer. Of course, wild caught salmon and other like products aren’t local but can definitely be of higher quality at a lesser price than from your local grocery store. However, keep an eye out for out of season produce during the early weeks of the market. Some vendors source product from distributors for resale. In fact, I’ve even seen early season fruits and vegetables with grocery stickers on them. YIKES! So, whether your at home or out of town, look up the closest local farmers market and enjoy the fruits (and vegetables) of the region!